Dr Blood's Video Vault: What happened to The Bloody Podcast? What happened to The Bloody Podcast? Most of you don't know this, but a couple of years ago, I used to regularly do a horror movie review podcast. I wasn't famous for it or anything (in fact only about 60 people ever listened to it), it was just something I tried out and enjoyed for a while even though it was really quite annoying to edit it into something that I was actually satisfied with each time. I think I did the last one early on in 2008 when horror movies were drying up and there wasn't really anything to talk about, or at least nothing that interested me. I also moved house and lost my microphone, so I just saw it as a bit of an omen that I should probably leave the podcasts to the other horror guys out there (especially as there are so many of them). Recently I had an email from the site which hosted my podcasts telling me that if I didn't upload a new show soon then they would delete my account. Ordinarily I would have just uploaded something somehow simply to keep the account active, but not after they already deleted over a year's worth of podcasts from my account anyway! Stuff like that is beyond annoying. I have backups of my audio files, but I really can't be bothered to reupload them, and so I now consider my podcasting career to be at an end. Sometimes I call into horror shows on BlogTalkRadio, but I haven't even been listening to that for a while. Things change, and I've become more of a written word kind of guy, so I've decided to stick with blogging instead. Maybe my writing will improve if I do it more. One thing I've noticed though is how easy it is to get out of writing. I often have to really think about the placement of commas and parentheses, breaking longer sentences into smaller ones, and avoiding ridiculously long words which most people would need to look up in a dictionary. I hate reading blogs like that myself, and I'm not somebody who uses a lot of big words when a lot of smaller ones will do anyway. Gushing flowery prose is so not me. I'm not the greatest writer in the world nor am I even trying to be. I just give my 100% honest opinion about the films I watch and the things I like and don't like, and if people enjoy reading any of it then good for them. I'm probably not as informative as I could be and keep falling into the trap of negativity, but I suppose that's just what happens when you watch too many films. Can you ever watch too many films though? Now there's a question. Anyway, "The Bloody Podcast" is no more. One day I might do it again, but I don't really want to right now. Some people enjoyed the shows I did, but I'm the first to admit that it's not really my area of expertise. I have also never bothered with YouTube either because I don't have the patience to make anything worth watching on there. Really, if you aren't "iJustine" or "VenetianPrincess" then you're wasting your time posting webcam videos. I don't watch any kind of horror on YouTube anymore other than a few trailers and certainly no movie reviews. What's the point of waving a DVD around to show people you've bought it and swearing about how bad it was? I can do that happily enough in my own home and have no desire to broadcast it to the rest of the world. I'm not sure how long I will even have the patience to keep blogging either. I've been writing my reviews since 1994. Those were the days of papery magazines which nobody bothers with now. In 1997, I moved everything online and sometimes I wonder if that was a mistake too. There's almost too much to keep up with if you are just one person running a horror site. 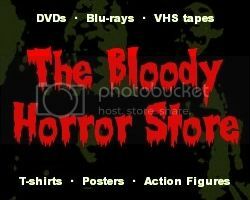 There used to only be a handful of horror sites back then, but now everybody seems to have blogs, message boards, podcasts, FaceySpace and God knows what else. It's information overload. No wonder I took the original "Dr Blood's Video Vault" down for nearly three years. I don't miss the days of being one of the 'Big 6" horror websites, but I'm uncertain about the future now that everyone has become a critic. Just trying to stay current with new releases and getting a "zero day" review is proving to be more trouble than it's actually worth. Pretty soon I'm just going to start going back over the "classics" though as playing catch-up after 18 months' hiatus is getting boring for me. I obviously can't review every horror film in the world, but I'm going to give it a damn good try. I don't often write anything personal like this on my blog, so don't expect me to start getting all conversational on here. I used to on MySpace when it still had categories, and every so often I'll dip back into one of the 800 or so posts on there and find something suitable to rewrite and repost again. I think I've become a little bit more self-conscious with Blogger than I was with the closed social networking systems. I have to keep remembering that this goes out to the whole world not just a selected group. What a ramble! Anyway, I thank you all for reading this and for subscribing to me over the years in one way or another. I'm going to take a couple of days away from this now to watch some DVDs, play with my cats, and give the beginnings of my repetitive strain injury from mousing a chance to subside. I've got a couple of hundred posts on here already, so feel free to read a few of them and leave me some comments.